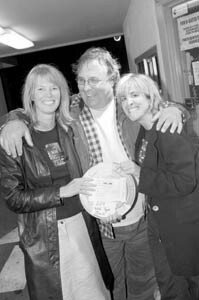 Oh Say Can You See: Aptos artist James Mazzeo, center, who contributed much of the artwork for--and stars in--Neil Young's 'Greendale,' poses with festival organizers Arlene Maltman, left, and Jane Sullivan. Not far from here in the fertile depths of Neil Young's imagination lies a coastal town of rugged green hills called Greendale, the namesake of the musical movie kicking off the Santa Cruz Film Festival on Thursday, May 13. The movie's dialogue is a Neil Young soundtrack telling the story of Greendale, whose denizens include the Green family and assorted characters such as an art gallery owner named Lenore, a cop named Carmichael and the devil himself, who does a funky shimmy down the sidewalk in one of the movie's best scenes. The film has no sound other than the 10 tracks of the Greendale soundtrack, which the actors lip-sync in place of regular dialogue. The plot has to do with a family saga, sudden murder, drug dealings and political and environmental activism, among other themes. Oh, and there's a gratuitous dancing cheerleader scene. Young said he wrote the songs in the car on the way over to the studio every morning. "When I was writing these songs, I was very surprised. 'Cause I'd never written a song that had characters in it and then another song that had the same characters in it. And then another one, day after day," Young told audiences during a solo acoustic performance of Greendale in Dublin, Ireland. "I don't make this stuff up, really, so when it happens, it surprises me as much as anybody else." If the end result is typical of Young's iconiclastic reputation, that suits Aptos artist James "Maz" Mazzeo just fine. A longtime friend of Young's, Mazzeo's paintings and pen-and-ink drawings are featured prominently throughout the film, and he plays the part of Earl Green. "Neil likes working between the lines," says Mazzeo. "People have to work if they want to be a part of this thing, and the viewer has to be a part of the process. His art is not obvious. My art is not obvious." Greendale was filmed just a stretch up Highway 1 from Santa Cruz, around Pescadero, Half Moon Bay and Young's ranch in Woodside. Local pride will swell at seeing Grandma Green cruising around town past Duarte's Tavern. The house where the Green family lives--known as the Double E--is one of the homes on Young's property, and the hillside where Sun Green builds a big "No War" sign out of hay bales belongs to Young's neighbor Dale Djerassi, who also shot some brief footage in the film of oil drilling at the Arctic National Wildlife Refuge. Young wrote, directed and filmed almost the entire movie with his own camera, a little hand-held super 8. The credits list the director as Bernard Shakey--a frequent alias of Young's. Shakey makes a very quick cameo in the film as Wayne Newton. "Neil loves cameras. If Neil didn't write songs and play guitar, he'd probably be a cinematographer in Hollywood," says Mazzeo. Greendale is not Young's first foray in pushing cinematic boundaries, although it's his most multifaceted project yet. 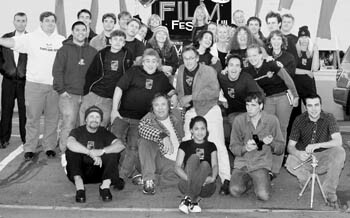 The first Shakey Pictures production was called Journey Through the Past, and it sometimes used to show as an opener to the Woodstock movie. Featuring footage inspired by Young's dreams and hippie life in Topanga circa the early 1970s, it earned a reputation from the few who saw it as unwatchable and confusing. Greendale is a multimedia blitz, encompassing the movie, the concert tour, the book and the CD, which comes with a DVD of Young performing acoustically in Dublin. Another DVD now out shows the making of Greendale, and yet another of the live concert is in the works. According to Mazzeo, Young is especially interested in making DVDs because the sound quality is superior to CDs. "If he can make an album with the newest and best in sound, the DVD-A five-channel sound, and he can be a cameraman too with the DVD visual, then ding-dong--it's time to make a DVD," says Mazzeo. Mazzeo is now putting the finishing touches on over 140 pen-and-ink illustrations for the book of Greendale, which will likely be released in November along with the DVD of the film. "In the back, there is a really nice supplement all about me and my artwork and my biography, which is really going to be a feather in my cap when it comes out," he says. A playful and endearing guy with bright blue eyes, Mazzeo comes off like part magician and part beach bum. In the movie, Earl Green is seen dejectedly hauling his paintings--actually Mazzeo's--back and forth from his camper bus--which is actually Mazzeo's camper, as well. Mazzeo is best known as the artist behind Young's 1975 Zuma album cover, a drawing of naked women and prehistoric birds which enjoyed the distinction of being selected by Rolling Stone as one of the most demented album covers of all time. The song "Bandit," in which Young softly croons the chorus, "Someday you'll find everything you're looking for," is one of Greendale's instant classic tunes, and the song is supposedly written for Mazzeo. In it, Young sings, "You're hard to reach, no one can reach you, but I can reach you." "And he can reach me, 'cause he's like my best friend, and he knows he can," says Mazzeo. The two have been friends for over 30 years. They first met in 1966 in Sausalito at a club called the Ark, where Young was visiting with his band Buffalo Springfield and Mazzeo, tinkering with melted gelatin slides and food coloring, was pioneering the psychedelic light show concept for Moby Grape. They got to be fast friends a few years later, when Young moved in next to Mazzeo's art commune in Palo Alto called Star Hill Academy for Anything, and in the next few years Mazzeo would move to Young's place and then go on tour with him as the road manager for Crosby, Stills, Nash and Young's world tour in 1974. The two have been housemates in Malibu, traveled across the country on Route 66, and they once attempted to drive across the Sahara in a 1934 Rolls Royce named Wembley. They never made it farther than Brussels, where the car blew up on them. From cardboard to potbellied stoves (one of which is featured in the book Handmade Houses), Mazzeo has created art in every medium. His abstract paintings are full of exuberance, color and joy, with titles like Death by Watermelon. He did a series called [email protected]#king with Picasso, replicas painted in glow-in-the-dark paint meant to be black lit, which were purchased by Young. But even with all that, Greendale "is one of my dreams come true," he says. "Who doesn't dream about being an actor and having all their art seen by people and loved by people? In fact, it's been more than a dream, I don't think I could have even dreamed as big as far as what Greendale has actually become in my life. I would have dreamed something just a little bit less and just been thoroughly ecstatic, but this is even more than that, and I'm at someplace just slightly above ecstatic. I'm not even sure there is a word for it." A Hollister native, Mazzeo says he has felt since he was a kid that in his 60s, 70s and 80s he would be a major American artist and pop culture hero. He just turned 60 a couple of weeks ago. Three months ago, Mazzeo says he stopped smoking pot and drinking coffee, and started exercising and trying "to do all kinds of things really right." "Neil has set the bar really high and I need be in the shape to meet that success," he says. Mazzeo's art will be featured in a special one-night exhibit at the Santa Cruz Museum of Art and History, an event that takes place right after Thursday's Greendale showing. Besides being an extraordinary artist, he is also one of Santa Cruz's best hopes for answering the Santa Cruz Film Festival's most burning question: Will Neil Young make an appearance at the Greendale showing? "I don't have a clue," says Mazzeo. "I did tell him that if he didn't make it that I'd be the one who would probably have to stand up and take his place in front of the audience and talk about his film, and that was the best way to threaten him that I could probably think of. But the rumor has it that the mayor of Greendale may actually show up for that evening." Greendale shows on Thursday, May 13, at 7pm at the Del Mar Theatre; $5-$6. The opening night party at the Museum of Art and History follows, featuring entertainment by Thomas Cunningham, paintings by Jim Mazzeo, and Ray Manzarek's film Light My Fire--Return to the Whisky a Go Go. Passholders and ticketholders only; $15 ticket to movie and party. From the May 12-19, 2004 issue of Metro Santa Cruz.